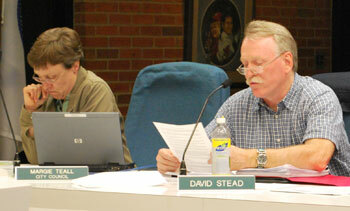 David Stead, right, reads a resolution he proposed at Thursday night's Environmental Commission meeting. The resolution, which was approved, recommends removing Argo Dam. At left is Margie Teall, a city councilmember who also sits on the Environmental Commission. At its Thursday night meeting, the Ann Arbor Environmental Commission approved a resolution recommending that the city initiate removal of Argo Dam. It is the opposite advice given by the city’s Park Advisory Commission, which last week on a 5-4 vote recommended keeping the dam. City council will make the final decision, which is expected within the next two months. At last week’s Park Advisory Commission meeting, 15 people spoke during the public comment period. Supporters of keeping the dam – many of them from local rowing clubs – outnumbered those in favor of removing it. The same number of people spoke at Thursday’s Environmental Commission meeting, but only six of the 15 speakers were in favor of keeping the dam. One of them, Sarah Rampton, explained that most rowers were out of town at a rowing competition in Canada. She said she had stayed behind, missing her daughter’s last regatta, because she felt she needed to advocate for keeping the dam. But after an hour of public comment and more than two hours of debate, commissioners voted 8-4 to recommend removal of the dam, primarily citing environmental benefits of a free-flowing Huron River. Several speakers were affiliated with the Huron River Watershed Council, which has advocated removal of the dam. Laura Rubin, the group’s executive director, said that because of issues raised in the debate, they’ve called on scientists at the state and national levels to revisit the data: “Our reputation is at risk here.” She said she had sent their findings to commission members, and that they’ll be looking for more local data as well. [Opponents have argued that the situation at Argo is unique, and that data collected from dams located elsewhere aren't valid comparisons.] Rubin said that many other organizations support dam removal, including the Michigan League of Conservation Voters, the Washtenaw Audubon Society, the Huron River Flyfishing Club and the Huron River Paddlers. Carsten Hohnke, a city councilmember who sits on the Environmental Commission, thanked the committee for their detailed recommendations. He said that he and fellow councilmember Margie Teall, who also is on the Environmental Commission, wear multiple hats, but on that night their role – and the role of the commission – was to look at the environmental benefits of removing the damn versus leaving it in place. There are financial and recreational factors to consider, but for this discussion he said he was only looking at environmental factors. Many respected environmental groups have looked at the issue and recommend removal of the dam, Hohnke said, and he’s come to believe there are significant environmental benefits to taking that action. He proposed asking this question: If no dam were in place, would we build one? The answer is clearly no, he said. Westphal asked Matt Naud, the city’s environmental coordinator, for more information on the hydropower option. Naud said the VA had approached the city several months ago asking if the city would be interested in introducing hydropower at Argo Dam. The VA is moving ahead by doing a feasibility study with the Army Corps of Engineers, Naud said. He said the VA has funding for the project and isn’t concerned about getting a timely return on their investment, as the city would be. When asked why that’s the case, Naud explained that federal agencies like the VA are given incentives to both reduce their energy costs and to use renewable sources. Westphal said that on a site-specific level, the information indicates that removal of Argo Dam would improve the ecology of the area. However, coming from an urban planning background, he said he takes a broader view and suggested that the commission itself could take that approach as well. One of his concerns is that rowers, if relocated to a different venue, would have to drive their cars a greater distance, which contributes to greenhouse gas emissions. He said that biodiversity includes the people who use the river. Like any urban amenity, he continued, natural features are sacrificed for the benefit of living in this kind of setting. The decision to remove Argo Dam is “not terribly clearcut for me on that wider angle,” he concluded. Wright also suggested that instead of a recommendation that the dam be removed, perhaps they should simply ask that further studies be done. Commissioner Valerie Strassberg said she agreed that the dam should be removed, but before that happened she wanted studies done about who uses Argo Pond and what types of revenues are generated, as well as investigating alternative forms of recreational use that might be available when the dam is removed. Margie Teall was concerned about the amendment calling for additional studies, saying that the state Department of Environmental Quality wants a decision by July 31, and that’s the timeline that city council needs to follow. They can do studies to implement the plan, but first they need to decide what direction to take, she said. Naud clarified that rather than spend money and staff time on studies that covered both dam removal and dam repair, the idea would be to pick a direction and then do studies related to that decision. If the studies resulted in information that caused council to change its course, they could go to DEQ and request a change, he said. He added that they could also ask DEQ for an extension on their decision, but it wasn’t clear if that would be granted. Chris Graham, the commission’s vice-chair, asked Naud whether there was temporary action that could be taken to protect the dam from failing. Naud said there were no signs of failure for the dam – DEQ had simply asked that the toe drains be repaired. Graham asked if they could do anything to buy time from the DEQ. Naud replied that the DEQ had requested the toe-drain repair five years ago – they’d already bought five years of time. Commissioner Gwen Nystuen, who is also a member of the city’s Park Advisory Commission and had voted for keeping the dam at last week’s PAC meeting, said her concern was that there’s very little information about the condition of the dam. There might be a low-cost way to repair it, she said. Naud reported that the city had budgeted $300,000 for repair. Westphal suggested there might be middle ground – perhaps partially draining the millrace and repairing some of the toe drains. He wasn’t comfortable just recommending more studies. Commissioner Rita Loch Caruso said that if they recommend further study, council would go ahead and make a decision without the commission’s input – they’d essentially be opting out of the process. Returning to Strassberg’s proposed amendment, Stead said that the city’s parks staff already provided information about users – it would be redundant to ask for that information again, and it doesn’t have anything to do with whether the dam is removed. Strassberg disagreed, saying that she wanted the community that’s worried about dam removal – the rowers – to know there’d be a study done about post-dam options for them. Responding to a question about the study of hydropower, Naud said the city looked at putting in hydropower systems at Argo and Geddes dams. The project would cost an estimated $4.5 million, and based on the amount of electricity and estimated revenues generated, it would take about 44 years to get a return on that investment, not including interest on a $4.5 million bond. Steve Bean, the commission’s chair, assessed that as a long payback period, especially for electricity usage. Lighting conversions for achieving energy efficiency, for example, have a 2-3 year payback, he said. Wright stated that conditions could change that would affect the payback period for a hydropower system at Argo, including an increase in the price of electricity and implementation of a federal cap-and-trade program. He said it wasn’t the most efficient way to produce electricity, but the dam is in place and someone in the community – the VA – is interested in exploring the possibility. “It’s at least worth a look at before we move forward,” Wright said. Outcome: Strassberg’s amendment failed – voting against it were Steve Bean, Rita Caruso, Anya Dale, Chris Graham, Carsten Hohnke, John Koupal, David Stead and Margie Teall. Whereas, Many river ecologists in the region have supported a recommendation to remove three priority dams: the Mill Pond Dam and Impoundment in Dexter, Michigan, Argo Dam in Ann Arbor, and Peninsular Paper Dam in Ypsilanti, Michigan. Whereas, The Michigan Department of Natural Resources (MDNR), Fisheries Division, recommended the removal of these three dams as a key component in the rehabilitation of the Huron River (Fisheries Special Report, No. 16, Huron River Assessment, April 1995). Whereas, the relocation of some recreational opportunities due to Argo Dam removal has the potential effect of generating higher levels of greenhouse gas emissions via greater transportation demands. Whereas, the future pricing of electricity is uncertain. Whereas, Argo Dam may represent an economically and ethically viable source of non-polluting energy at a future date, either for the City or in partnership with other entities. Whereas, the Argo Impoundment currently provides for the greatest number of recreational trips of any segment of the Huron River in the City and, as such, constitutes a significant urban amenity near the downtown core. Whereas, studies demonstrate that urban living (in which residential, employment and recreational opportunities are located in close proximity) has a significantly lower impact on the environment than non-urban living. Whereas, the maintenance of the Argo Impoundment enhances the appeal of living in the City by providing a) a significantly larger total water area available for some recreational opportunities and b) a central location near the urban core for some recreational opportunities. 4. Evaluation of user groups and resulting revenues. Hohnke said that the price of electricity, referenced by Westphal’s second “Whereas” clause, is irrelevant to environmental considerations of the dam removal. He also took issue with the assumption that the impoundment, or pond, constitutes a greater urban amenity than a free-flowing river would. There may be a greater attraction for kayakers, canoeists and fisherman after the dam is removed, he contended. He said it was unclear whether rowers would have to travel farther to get to Argo than they would to get to Barton or Geddes – we don’t know where they live, so we don’t know where they’re coming from, he said. As for hydropower, Hohnke concluded that it’s already been studied, and if the VA decides to move forward with hydropower, that doesn’t have anything to do with the environmental impact of the dam, which is the commission’s responsibility. Stead contended that Westphal’s “Whereas” clauses were suppositions, not facts. Commissioner Gwen Nystuen noted that the Park Advisory Commission had voted 5-4 in favor of keeping the dam, because they felt that removal was disruptive and that there were options to repair the dam that cost significantly less. She also said that taking out Argo Dam did little to help the river, since there were dams on either side of that impoundment. Strassberg brought up the issue of users again, and Colin Smith, the city’s parks and recreation services manager, came to the podium to address that issue. He said there’s great interest among kayakers and canoists in having a free-flowing river that wouldn’t require a portage. If there’s a decrease in users, it would come from “pond paddlers” who don’t want to canoe on the river, he said, but they could use Gallop Park as an alternative venue for pond paddling. Strassberg inquired about usage patterns of the park around Argo Pond, but Smith responded that they didn’t have any way of tracking that activity. John Koupal, the commission’s newest member, said the commission’s charge was to look at environmental tradeoffs. He agreed with Hohnke that the amendment’s clauses about urban amenities and increased vehicle trips were speculative. Regarding hydropower, it didn’t seem to him that this would be the first place they should invest alternative energy dollars. Wright responded to Caruso’s statement about hydropower seeming to trump environmental concerns. He noted that by that logic, they should remove all the dams. Caruso responded by saying that the issue is that Argo Dam isn’t functioning as it should – it’s a dysfunctional facility, and is it worth investing in to repair. Hohnke said that he and his colleagues on council would be struggling with competing interests. He urged the commission to be as clear as possible in their assessment of environmental factors, noting that the city council would have the recommendation from the Park Advisory Commission that speaks to recreational issues, and the Energy Commission would give input on hydropower. The Environmental Commission dilutes its input if it includes assessments of recreational and energy uses, he said. Westphal contended that having the impoundment at Argo and providing the rowing amenity is a way to encourage people to live in the city – and that has environmental impacts. He had serious doubts about the ability to relocate the rowing community. The ecological factors surrounding removal are real, he said, and the potential benefits are fairly subjective. The notion of payback on a hydroelectric system is an open question for him, he said. Fixing the dam could cost a lot less than $300,000 and they could always revisit its removal in the future. But if they take it out now, there’s no going back, he warned. Bean said he wouldn’t be supporting the amendment. But he disagreed with Caruso that recreation wasn’t in the commission’s purview – one of their goals is to have a health-promoting urban environment, and use of the river fits into that. Hydropower also fits within the scope of the commission, he said. But he doesn’t expect the Huron River to support the community’s recreation and electricity needs. It’s a system – part of a watershed – and it’s been degraded, he explained. If they balanced the ecological quality of that system against its economics and recreational value, it’s clear they need to improve the ecology, Bean concluded. The other areas “are doing just fine,” he said. Nystuen questioned Bean about other impoundments, noting that the HRIMP report calls for a free-flowing river. If they supported the original resolution, she wondered if that meant they should get rid of all the impoundments? Bean said it might be the case that in the future, the other impoundments would be removed. He also noted there are ways to improve the river’s ecology without removing impoundments, such as by adding fish passages to existing dams. But for the amendment under consideration, it’s not relevant, he said. Outcome: Amendment failed, with Steve Bean, Rita Caruso, Anya Dale, Carsten Hohnke, John Koupal, David Stead, Valerie Strassberg and Margie Teall voting against it. Strassberg again stated that she wanted to add an amendment that there be a detailed investigation of alternatives for rowing venues and a study of users and resultant revenue in the wake of dam removal. Hohnke said the HRIMP report includes a recommendation that alternatives for rowers be vigorously explored, and states explicitly that an alternative is desired – the amendment would be redundant. Naud said the process of removing the dam, which includes getting necessary permits from the DEQ, would take a while, and that they likely wouldn’t begin actual removal for at least a year. That would give them time to work on finding alternatives for the rowing community. Outcome: The amendment failed on a voice vote. At this point, 10:20 p.m., Graham asked, “Are we getting close to voting?” Bean said, “We’re getting closer.” After some additional discussion, a vote on the final resolution was taken a few minutes later. Outcome: The resolution – which included the recommendation to initiate activities to remove the dam – was approved on an 8-4 vote, with Graham, Nystuen, Westphal and Wright dissenting. If the final outcome of this debate is that Argo Dam will be removed, then the rowing community is guaranteed a city-assisted relocation to another venue. While the 600 rowers that use Argo Pond today will have to adapt to a new body/bodies of water to practice and train, the free-flowing section of Huron River between Barton and Geddes dams will benefit thousands of new users annually. As a destination for paddling, fishing, bird watching, running, bicycling, and more, the improved ecology of an Argo-free Huron will be an economic and social boost to downtown Ann Arbor. Keep the Argo Dam. I grew up a stone’s throw from Argo Pond and it is a fine amenity. Drain the millrace and use the recovered land for additional parkland. Then all you have to do is improve a canoe portage around the dam (as opposed to at the foot of the millrace). And I refuse to listen to an purported ecological benefits of removing the dam that are not supported by scientific data; I share the hunch that dams are worse than no dams, but we cannot go around tearing out infrastructure based upon hunches. I agree 100% with Jonathan (especially since the rowers are to be accommodated) and take issue with Steve’s assertion that there is no scientific data to support the removal of the dam for ecological reasons. While I do not have the studies at my disposal to cite here, I know they exist and assume that the Huron River Watershed Council would be more than pleased to make them available. If the Environmental Commission is charged with looking at only the environmental benefits of removing the damn versus leaving it in place, should they not consider the city’s need for additional power and the environmental impact of the alternatives energy sources that would produce an equivalent amount of power that Argo Dam could generate? I look forward to the Environmental Commission passing related resolutions advocating the expanded use of non-renewable fossil fuels, nuclear power, and dirty co-gen plants to make Ann Arbor more energy secure. There is a significant amount of scientific data available that reports on the conditions of Argo Pond. The collection of data and integration of data sets are two of the functions of the HRWC. In fact, this data was referenced throughout the HRIMP committee deliberations and planning efforts. I suggest visiting or contacting HRWC to learn more (http://www.hrwc.org). The fact remains that even the data capacity of NASA will not satisfy some pro-dam advocates. The BEST alternative energy is actually energy efficiency. Why install an expensive solar panel system on your home if you’re still burning incandescent bulbs and leaving the lights on all the time? The often-stated fact that Argo Dam will take 40+ years to recoup the costs of retrofitting it for hydro-power is an indication to me that the dam–while it is capable of producing hydro-power–isn’t very efficient at doing so. Efficient city light fixtures, green roofs on city buildings, and even simple building-use policies–all could have a much quicker impact on Ann Arbor’s energy savings and efficiency (and, possibly, at a much lower cost). A vote for removing Argo Dam is not a vote against alternative energy. It is a step in the right direction, towards a more welcoming and usable city environment, an economic boost through recreation, and a healthier Huron River. I agree that conservation is an important step in becoming more energy secure, but I also believe the cost estimate in the Stantec study for the retrofit for hydroelectric power is inflated and the cost per kilowatt/hour used to determine payback does not include an inflation factor nor does it consider the cost of electricity once a carbon cap and trade system is implemented. I believe the payback for retrofitting is now less than twenty years and once a cap and trade system is implemented, the payback will be closer to ten years. The city has not even considered the proposal advocated by Joe O’Neal, owner of the company that rebuilt the dam in 1972, to close the gate and drain the millrace. It would cost the city very little (less than $100,000) and maintain the dam infrastructure for future development. The cost to remove the dam, redevelop the land, and relocate the rowing community is easily estimated to be over 2 million dollars, money the city of Ann Arbor does not have and will never spend. The politics of the proposal does not make any sense to me either. The rowing community is made up of rowers and parents of rowers, past and present. Each school has 75 to 100 student each year on the crew teams. Huron Crew has been in existence since 1993, Pioneer Crew has been around since 1999. There are thousands of voters/property owners/taxpayers that have been positively affected by rowing on Argo Pond in the past 20 years. I suspect that very few members of the groups advocating for the dam removal (i.e Michigan League of Conservation Voters, the Washtenaw Audubon Society, the Huron River Flyfishing Club and the Huron River Paddlers) actually live in Ann Arbor. Joe, doe you have any hard data to back up the beliefs that you state in the first paragraph your comment immediately above? If you do, it would be helpful to make a link or citation available. Obviously a forty year payback is not a good investment, a twenty year paybacks is at best marginal, but a ten year payback does start to make sense. However, to convince anyone to move forward with such a plan requires some more hard data. I do again agree with Jonathan that energy efficiency is the best way to capture the low lying fruit in the energy debate. Just think of the trade-off of drilling in ANWR and off the coast of Florida and California versus driving a high mileage car or taking public transportation where that is feasible. In that vein, I consider it highly unpatriotic to drive any vehicle that does not exceed 30 mpg. To think that we are sending our young people to die in the middle east so that some yahoo pseudo-patriot can drive a Hummer (alone) makes my skin crawl. If we cut our transportation fuel use by just 20% by driving 30 mpg + vehicles we would change the balance of power in the oil world for sure. On another point, that of the rowers, I must admit that I’ve not been to any of the meetings so I may have missed this, but other than momentum and the tradition of using Argo Pond, what is the basis for the rower’s objections to being relocated to Gallup or Barton? I’ve not seen anything solid on this point in the discussion. Again, I may have missed this but if so, I think that it would be helpful for someone from the rowing point of view to make the case again. I believe VA and the US Army Corps of Engineers will be conducting a feasibility study that will look at the construction cost estimate and the payback in the very near future. Contrary to what Mr. Naud said at the meeting, I doubt the federal government “isn’t concerned about getting a timely return on their investment, as the city would be”. It has to pass the smell test for any proposal to fly. The city owns only a very small patch of land that is too close to the dam to safely install a dock and too small to accomodate the parking currently available at Bandemer. The residents of the area have also been vocal opponents of rowing on the Barton Pond in the past. Rowing on Geddess Pond would require reconstruction of foot bridges at Gallup Park and, I would think, some dredging of the river near Furstenberg Park, to accomodate the larger shells. City officials are also concerned about conflicts between rowing teams and users of the Gallup Canoe Livery. I’m sure the Gallup Park site would be great for Huron Crew, but Pioneer Crew, Ann Arbor Rowing Club, and the Michigan Men’s Rowing Program would be out of luck. Both sites would require a new boathoase, docks, and parking. As stated above, the cost to remove the dam, redevelop the resulting park land and relocate the rowing will cost WAY more than the city will ever spend. I do believe VA and Corps of Engineer are doing a feasibility study. I based my statement on the $0.0835/kWh figure used to calculate payback in the Public Meeting Primer. The cost is now closer to $.09/kWh and historically, electric rates have outpaced inflation. The cost of the carbon cap and trade system is being debated and there are many articles online (for example, link to cap-and-trade article) and while I support the concept of cap and trade, I do believe the cost of electricty will go up even faster. Jim, Thanks very much for the clarification about the concerns of the rowing community. I understand that NIMBY is going to be a problem with Barton Hill Residents, but they don’t vote in the City! The lack of suitable land for the boathouses, parking etc… @ Barton could be a problem however if it could not be solved. I understand the concern about a conflict between the rowers and canoe renters @ Gallup Park, and that might be resolved with careful scheduling and/or “no go zones,” but why do you think that the Gallup location would work for Huron High but not the other groups? As far as I know, Argo is not near Pioneer High or the U of M and the Men’s rowing club presumably has members living all over. Would those three groups not simply have to drive to Gallup instead of Argo? Joe, I’d like to see the results of the VA and Corps. feasibility study when complete, do you know the time frame for this. Do you have a sense of how much electricity could be generated @ Argo? If it was not a sufficiently significant amount (and I admit I don’t know what such an amount would be) it might not be worth the environmental trade-off involved in keeping the dam. I believe Argo is more accessible to the Pioneer and U of M rowers simply because it is closer. Many rowers bike to Bademer Park and I do not think they will bike to Gallup Park. The bigger issue at Gallup Park is the significant cost to accomodate rowing on Geddes Pond. Regardless of what is promised by the city, I simply do not believe there will ever be enough money in the city budget to relocate rowing to Gallup Park (or anywhere else). To me, the arguement comes down to Option 1 – spend $100,000 to close the headrace gate plus maintenance cost of the Argo Dam (which, btw, should be shared with the Ann Arbor Public Schools, U of M, and the city) and maintain the dam, which has a useful life of 50+ years and great retrofit potentail, Option 2 – Spend $2 million plus to remove the dam, redevelop the land and relocate rowing, or Option 3 – Spend $1 million to remove the dam, let the resulting land become overgrown, and screw the rowers. I as a resident of Ann Arbor, Option 1 is the obvious choice. Jim, I’ve got to admit that initially I was a proponent of removing the dam (I am a fly fisher of minor capabilities, an unabashed environmentalist and a Board Member of the Michigan League of Conservation Voters.) But after having read everything about this subject in the Chronicle and AA News, and the cool headed responses to my posts in this thread, I am now coming down on the side of Option 1 as well. The Huron River is already environmentally impaired due to the many dams and impoundments along its course as well as the pressure that the existing nearby development (sewers, septics, fertilizer, nasty runoff, etc…) places on it. There is no realistic hope of ever returning the entire river to it’s pristine natural habitat unless the auto companies go totally kaput or we have some other “Day After” type of event, so we need to be realistic about what we can and should do. While keeping Argo Pond may not be the environmental nirvana, neither would taking it down solve all the River’s problems. I believe that the recreational and environmentally oriented educational opportunities that Argo pond offers to the community more than offset any environmental benefits that a couple miles of free running river would provide. Accordingly, I hope that City Council votes to keep the dam and pond with whatever repairs are needed to make it safe, and further, that they follow up on the hydro power opportunity if the studies show that to be a good investment. Thanks all for your help! Joe, the city currently gets about 5.5 cents per kWh for electricity sold to DTE from the landfill methane capture operation and the two dams. The MPSC recently approved an increase in the minimum that independent power producers must be paid for electricity by the utility companies to 6 cents per kWh. (We don’t have net metering in Michigan, so DTE doesn’t pay generators the same rate that we pay them. While it’s true that the calculation of the payback on adding hydro generation to Argo dam doesn’t include an inflation factor, it also doesn’t include the cost of money. The 8.35 cents per kWh is a reasonable rough value to use, I think. Steve, I would hope the VA would look at both selling the power back to DTE and paying for transportation back to the VA. I still think the payback will be there with one option or the other. Leasing a portion of the dams must be factored into the the life cycle cost of the proposal. I am told the power generated by Argo and Geddes Dam could produce 25% of the electricity need for the VA. It seems to me that the HRWC site makes conclusory statements without data. Better fishing? Ask the anglers who ply the waters beneath M-14 rather than the river below the dam. Better canoeing and kayaking? Ask the rowing teams where they would rather put in. Natural control of invasive plant and animal species? Just what do you think will emerge in the “30 acres of brand-new parkland” the drained pond will reveal? Garlic mustard…lots and lots of garlic mustard. And the claim that the dam requires $500,000 in immediate care lest it fail is false. The earthen berm along the mill race is the only portion that is (allegedly) suffering from any infirmity. The sensible thing may be to drain the mill race, gain the parkland, and build a portage around the dam. Argo Pond is a nice urban amenity that draws users to the river and, so far, I have heard no set of specific articulable reasons to remove the Argo Dam and drain the pond. Again, not a dams-are-worse-than-freeflowing-rivers argument in the abstract, but with regard to THIS dam along THIS river at THIS location creating THIS pond enjoyed by THIS town. The earthen berm along the mill race is a sloppy muddy mess in the springtime, and it’s not hard at all to imagine a combination of spring floods that causes that levee to be overtopped. Of possible interest to commenters on this article is this announcement by the city’s director of community services, Jayne Miller, at yesterday evening’s city council: The June 15 council meeting will be preceded by a work session on the Argo dam issue. That work session is scheduled for 6-7 p.m.
Miller also indicated that council’s formal public hearing on the Argo dam issue is currently planned for July 6, 2009. Dave – Thanks for the information on the city council work session and public hearing. I also really appreciate the Ann Arbor Chronicle for making this forum available. Bob, you’ve made an argument that can be generalized to one that says we should do absolutely nothing to improve the state of our environment. Care to rethink it? Here’s some of my thinking on that point (which I don’t remember having been brought up by others besides David Stead, the committee chair): Given that we are the only community that draws its drinking water from the Huron, I think that we have a unique interest in how the river is used and impacted, particularly by those communities upstream from Ann Arbor. If we say that we need not only two power generation dams and a drinking water reservoir, but also two recreational dams, do we seriously expect other communities to potentially remove or at least better manage their impoundments in order to protect our drinking water source for us? Or to protect the spawning grounds of fish we want to catch and the aquatic organisms they feed on? Or reduce runoff upstream to prevent flooding and maintain good water quality in the stretch of the river that passes through our community? I appreciate those who understand that this is a complex issue, with many facets. As Steve points out, it isn’t just about recreation, or personal use. My deeper appreciation for the Huron is rather recent, I admit, but it was a truly eye opening experience to follow this amazing river from the beginning to the end. I’ve paddled the whole length, except for two lakes. I’ve visited every dam there is along the way. The question of dam removal has to be considered in the larger context of the entire watershed area, nearly 1,000 square miles. It isn’t just about rowing or money saved. And this decision also has impact far into the future as well. The scientific evidence I’ve seen, the environmental experts I respect, all point strongly towards removal. That coincides with my direct experience of the river and my personal (if fairly limited) understanding of river ecology. I support removal of the dam. Steve – you use a classic straw man argument to counter Bob. You should be able do better than that! I understand Bob to say that, upon further review, the cost-benefit of removing Argo Dam just isn’t there and I agree. Linda – As a voter, property owner, and taxpayer in Ann Arbor, the question BETTER BE ABOUT THE MONEY or my elected representives on city council have failed me miserably. I understand the unelected environmental activists on the Environmental Commission are more concerned about their credibility in the activists community than good public policy, but I expect much more from city council. Then I guess I’ll have to question your reading ability, Jim, including that of my mind. Volunteer for 18 years on city commissions and/or look at my record and then maybe you can judge my commitment to public policy (and that of my fellow commissioners.) I’m not an environmental activist (just ask the environmental activists), I’m a proponent of sustainable community. I’d be happy to discuss the differences with you. His conclusion (“I believe…”) is based on neither the above (how could it be?) nor on any other comparison of data points. It’s a belief. (Similar beliefs brought us mountaintop removal for coal extraction, fisheries collapse in the oceans, accelerated species extinctions worldwide, global warming, etc., etc.) Congratulations, he’s been convinced. Maybe it’ll work on council members too. Here’s a question for proponents of keeping the dam (or anyone), in the spirit of Dave Askins’ concept of Journalist Citizen: How will we improve the ecology of the river (within Ann Arbor city limits) to a similar extent possible through dam removal, if Argo Dam remains? I’m asking because I don’t know how. Apparently, from your 18 years of service, you have mastered the arts of cherry picking the data to fit your agenda (which has been effectively countered by Mr. DeBoer in his May 22 essay in the Ann Arbor News) and attempting to omit legitimate alternatives (as described by Mr. O’Neal in his May 22 essay in the Ann Arbor News) from the public debate. My integrity is unrippled by the wind of your mischaracterizations. I look forward to more substantive challenges. If my representatives on council were only concerned about the bottom line and made decisions purely on saving money I would work to replace them. Fiduciary responsibility is not just monitoring expenses and keeping them low, but also the wise use of funds, and issues beyond money as well. Planning for the future is a critical element of that responsibility. My point is that this decision has far reaching implications – in the future health of the river (up river and down), the greater environment, as well as future costs of maintenance. It certainly also impacts our local rowers and their future. If our elected officials aren’t visionary and willing to make hard choices from a larger and informed perspective, then they aren’t doing their duty. I’ve met many of the people on the environmental commission, and they don’t have to be concerned about their credibility. You either have it or you don’t. Just to clarify for some folks, since there are some fairly cavalier references to moving rowing elsewhere, not all water on the Huron is the same for rowing, nor are all the rowing programs’ needs for water identical. So it’s not just a matter of moving us to Barton or Geddes, and all will be the same for all of us. Collegiate crews race 2000m in the spring (our major season); high school crews race 1500m for most of their races, but there are also some that are 2000m. Masters rowers (the majority of the Ann Arbor Rowing Club) race 1000m in their summer season. Each distance can require slightly different variations of a standard training regime. I have coached high school programs on as little as 1000m of water (though it was quite a challenge), but can’t imagine trying to (successfully) coach a college program on anything shorter than the 3.2km of water we have on Argo Pond. (Geddes is shorter than that; Barton may or may not have that much water, depending on how shallow the water gets at some times of the year). If Argo Dam were removed, U-M at least, would probably have to move rowing out of Ann Arbor altogether (most likely, if an agreement could be reached, would be on Ford Lake in Ypsilanti), greatly increasing both the greenhouse effect, and the time and expense for our athletes. (As a club-varsity sport, we are not supported financially by the University in any significant way; this cost would be borne entirely by the athletes). There is only enough space at Barton for one small boathouse, that could probably house a single program at best, so only a part of the rowing community could move there. Argo is already at capacity as far as rowing goes. The two high schools stagger their practices to allow everyone to have enough space on the water; any time the U-M team can fit it into our schedule, we row at times other than the high school practices. Ann Arbor Rowing Club tends to practice either before U-M in the morning, or after U-M in the afternoons. All three school programs are off the water during the AARC’s primary season, the summer. In the fall, when all of us are rowing a longer “head” race season (about 2.5-3 mile races, as opposed to the 2000m (1.25 mile) spring races), the amount of traffic on the water is quite heavy. So, we many need to move some programs to other water anyway. To those who have supported taking out the dam without knowing the ins and outs of rowing and our needs, I suggest you take the time to learn about them. I remain available to anyone who would like a thorough explanation of our needs. Linda, I appreciate your love of the river, and the river as a whole. I spend a lot of time on a particular stretch, that I also love. I’ve read the same materials (I assume) that you have, and I do have to say, that other than “a free-flowing river is healthier than a dammed river,” there’s not really much there. And taking this dam out will not make the river free-flowing, by any stretch of the imagination. Jonathan: The river already is a destination for all the recreational uses you list; taking the dam out or leaving it in doesn’t change that.